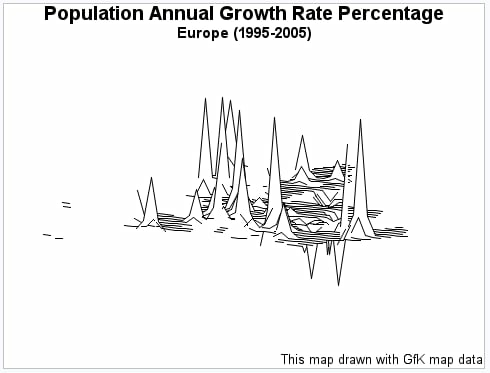 This example produces a surface map that shows the annual population growth rate of countries in Europe. Not all the countries that are represented in the GfK map data set have demographic data in the response data set. The CONSTANT= and NLINES= options are not used. Therefore, the GMAP procedure draws a surface that consists of 50 lines and uses the default decay function to calculate spike height and base width. And because the ROTATE= and TILT= options are not used, the map is rotated 70 degrees around the Z axis and tilted 70 degrees with respect to the X axis. Produce the surface map.Use the option STATISTIC=SUM to chart the summed value of all observations with a given matching ID. The ID statement specifies the variable in the map data set and the response data set that defines the map areas.